In May this year, we provided an example of how CCTV in conjunction with facial recognition technology was being used to heighten awareness of domestic violence. To underline the value and versatility that CCTV can bring to business, here is another great example of billboard advertising, this time by luxury sports car manufacturer, Porsche. In this example, an intelligent CCTV analytics system and car classification system has been specifically programmed to change a billboard display each time a Porsche approaches. The analytics system required matches for both vehicle shape and colour for the billboard display to change, making the system highly accurate and extremely effective. This information is then combined with details such as total car counts, weather conditions and time of day to produce very detailed analytics for the billboard company. The key to the success of all CCTV analytics applications is correct camera selection, correct camera positioning and of course, the system programming. Australia is recognised as one of the most competitive vehicle markets in the world with more than 60 brands sold locally and several hundred different models. When you consider what that means in terms of the variables this system has to deal with, it really highlights the intelligence and power of these programs. This particular application is from VEHCIO and is distributed by Digital Security Services here in Australia. VEHCIO is just one of a number of non-traditional CCTV vendors who are moving into the analytics space. Business and industry are learning what opportunities there are to improve business intelligence from CCTV deployments while still maximising their investigative and evidentiary value. 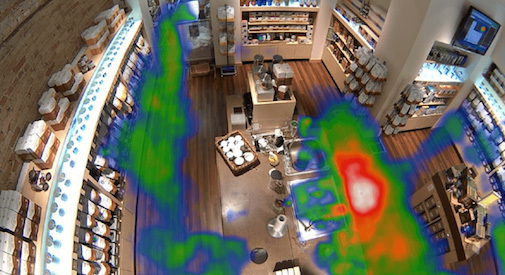 In the retail environment, analytics are used to track traffic patterns in the store. The analytics will demonstrate how the store visitors move around the store, where they linger, and what parts of the store are best for positioning key merchandise. As in the case of the Porsche billboard, the CCTV system will provide not only increased security and reduce the risk of loss, but also provide valuable business intelligence. How do you think CCTCV could be used to improve productivity in your work place? The applications now are extensive and really only limited by our imaginations. If there is a process to be improved or monitored, items to be tracked or counted, chances are CCTV will be able to add value in some way.